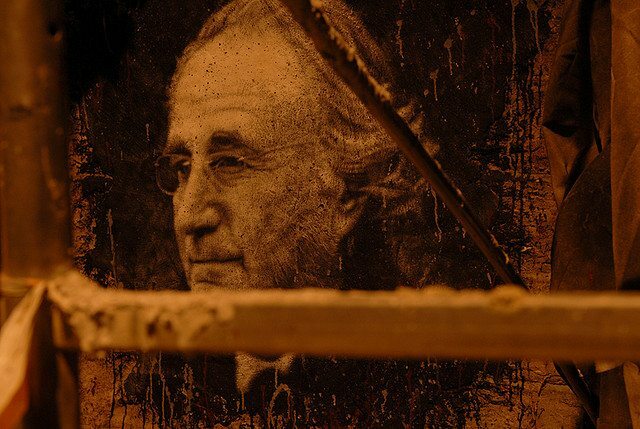 In the annals of felons who have done damage to both foundations and public charities, no one ranks higher—or lower—than Bernie Madoff, who perpetrated the largest Ponzi scheme in American history. On occasion, Madoff has spoken from his medium-security prison cell with a confusing combination of remorse and irritation about the events his illegality spawned, including his estrangement from his wife and the suicide of one of his sons. Bipartisan crooks: Although Madoff apparently had nothing good to say about President Obama (calling his policies “too socialist”), he noted that he voted for Obama in 2008. His most admired politician is the progressive Oregon Democrat Ron Wyden. The roster of beneficiaries of his campaign giving includes plenty of prominent Democrats, including Sen. Chuck Schumer, former New Jersey governor Jon Corzine, Sen. Jeff Merkley, and Hillary Clinton. Politico notes that when Schumer and Wyden were asked to comment on the Madoff interview, both quickly demurred. Stealing money, even from retirees and charities, is a bipartisan escapade. No remorse for charities: A large proportion of the charities that Madoff plundered were Jewish charities. Does Madoff feel remorse that he undid the charitable resources of huge numbers of Jewish charities? Not a bit. In fact, in Madoff’s convoluted thinking, charities may have lost, but not before they reaped benefits: “I’ve made more money for Jewish people and charities than I’ve lost.” The lesson for charities? Don’t expect the plunderers of your assets to care two whits about your charitable status and mission. Systemic looting: Madoff knows, like everyone should, that there are others out there with Ponzi schemes looking for unsuspecting investors. His advice? Investors should stay away from the stock market. In other words, if you lose your shirt investing with crooks like him, it’s your fault. And even though he knows he was guilty, he sees his crime as a “horrible mistake,” a temporary personal deviation from the right path, not being part of a subsector of criminals preying on charitable investors. Short penance: He sees the public’s view of his crimes as exaggerated and his efforts to make investors, including charities, whole, or at least compensated for their losses, unacknowledged. In fact, he feels unappreciated for his efforts “to help people recover.” Unlike other felonious philanthropists, Madoff doesn’t have any of the billions he looted and therefore cannot whitewash his image and name with mega-gifts to universities and hospitals. But it seems reasonably clear that if he were in the position of some other Wall Streeters who were convicted of investment crimes, he would be joining them in making philanthropic gifts and expecting accolades for his penance. Compounding lies: Perhaps there’s no big difference for those investors and charities that lost with Madoff, but while Madoff says that he only cost investors $10 billion in lost money, Irving Picard, the trustee in charge of overseeing efforts to recover lost moneys, puts the figure at closer to $20 billion. In fact, Madoff resents Picard, not for Picard’s role in recovering lost funds, but for his failure, in Madoff’s mind, to recognize what he, Madoff, has done in this regard. Referring to Picard, Madoff said, “He’ll take credit for everything but I can assure you, I played a major role in that.” The response of Picard’s office was straightforward: “The SIPA Trustee’s position is that, as the perpetrator of the largest Ponzi scheme in history, Madoff’s credibility is highly suspect and has no substantive value.” Is Madoff all that different than the other investment criminals who may have stolen millions, even billions, but still far short of Madoff’s ill-gotten gains? Doubtful.